She tossed open the box from Payless and snatched out the two shiny black shoes with metal plates on the bottom. 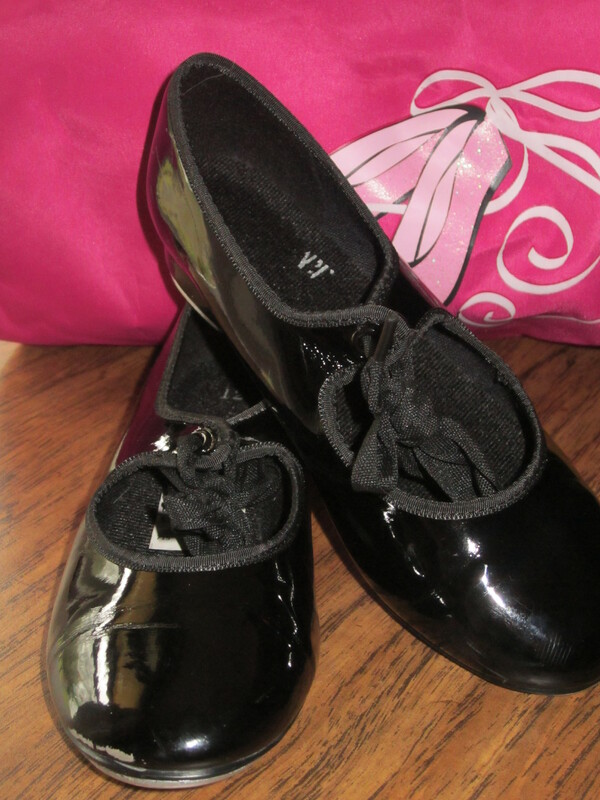 Tap shoes: Her little six-year-old heart’s great desire! She slipped her feet in and immediately started performing. Then my eight-year-old crammed her feet into the shoes and put on a grand show. My three-year-old even stepped into the shoes and shuffled round the kitchen a bit. They were like magic shoes, all shiny and loud, and they transformed any girl into a superstar on a grand stage. On the first day of tap lessons, my girl clip-clopped her way into the dance studio along with the other excited students. I heard them take those first steps onto the wooden floor, hesitant at first, and then heard them break into freestyle tap routines of their own. How could they resist? This studio and those magic shoes made them all feel like Gene Kelly or Fred Astaire. It was inspiration and joy and visions of grandeur accompanied by tip-tapping rhythm. Then the lessons began, and the order to contain the disorder…the structure, the routine, the method to the madness. It’s a slow realization for a kid, but eventually it comes: tap dancing doesn’t just mean slamming your feet on the floor in any combination of athletic flailing you choose. You have to watch and listen and then move in just the right way. You have to drill and rehearse and repeat. For a week, I asked my daughter to “shuffle” and “flap,” and practice, practice, practice. Then, because I know absolutely nothing at all about tap dancing, I asked her if she was doing it right (because, after all, how was I to know?). She rolled her eyes at me occasionally and huffed loudly at times, blowing her bangs up off her forehead in exasperation. Reluctantly or not, though, she practiced. When she returned to class and shuffled correctly and the teacher announced, “You all must have been practicing,” that was the reward. My daughter beamed. She loves tap, she declares. Life and tap-dancing, they can convince us all at times that inspiration is all we need. They can woo us into running on spiritual and emotional highs. We’re at our best. It’s fun and grand (and noisy perhaps). And the lessons and the practice come easy. Quiet times are easy, too, when God is speaking so clearly we can hear His voice ringing in our ears. When that time with Him is overflowing, it’s no great discipline to carry our bucket to the Well. And we have these seasons with Him, where we’re hearing and learning and it’s thrilling to be used and useful, to see ministry grow and faith deepen, to see prayers answered and miracles happen, to read God’s Word and actually feel it tingling in our souls. It’s a slow realization for us, perhaps, but eventually it comes: This walk with God isn’t always easy and the emotions and the highs and the results we expect aren’t always immediate or obvious. It’s waking up, pouring that cup of tea and opening up that Bible not because it feels so good, but because this is how we grow over time. It’s going to church even when the sermon isn’t about your needs and singing even on days when it’s hard to really mean the words on the screen. It’s praying even when you don’t sense the connection and it feels like silent heaven and empty air. It’s committing to Bible study even when you’re busy, tired, distracted, complacent and just downright don’t feel like it. Yes, it’s practice and rehearsing, repeating, growing slow and steady, committing and then choosing not to give up–not today, not tomorrow, not a week from now. It’s feeling the desperation of the deer panting after water and heading to the stream even when it’s elusive and difficult to find. And like, Elijah, it’s listening for God’s voice even in despondency, depression and despair. He stood on that mountain and listened for God. Even after the mighty wind passed by, the earthquake ceased shaking, and the fire abated, still Elijah listened. He could have given up: God’s not speaking. I couldn’t see Him in the big and the obvious, the glorious and spectacular, the emotional or the ear-shattering. He could have headed back into the cave and abandoned the effort. And then he would have missed it. No, Elijah continued to stand, waiting, listening, still. Sometimes it’s there in the quiet that we hear God simply because we haven’t given up. We’ve continued to stand in His presence beyond the silence, faithfully and determinedly waiting…listening…still. Beyond the point of inspiration, fun, glory, and ease, we discipline ourselves to listen. And so we hear. It does seem like we want to buck the idea of “discipline” in our spiritual walk, but it is what we need in order to dig our roots deep in Him!